Comfortable. Affordable. And more power to you. 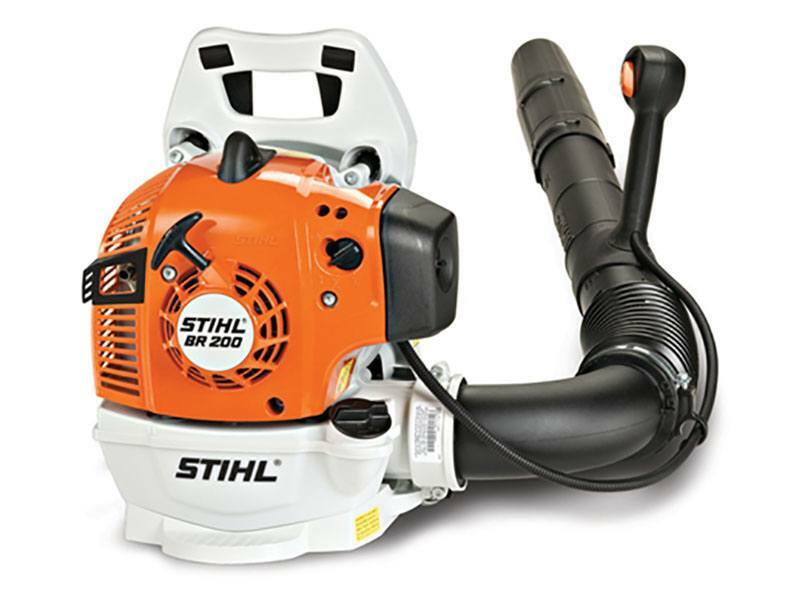 The fuel-efficient STIHL BR 200 blower puts the quality of a professional backpack blower in the hands of homeowners everywhere. Its single-handed operation is easy to control, while its lightweight design and anti-vibration technology enhance operator comfort. The 35.5 oz. fuel tank also means fewer refuels compared to handheld blowers; hence, fewer interruptions to the task at hand. FOOT PAD: For stability when starting. PROTECTED FUEL TANK: Helps prevent damage. UPRIGHT FUEL TANK: For easy filling. EASY TO REPLACE: Starter assembly. PROTECTED CHOKE KNOB: Helps prevent damage. PROTECTED SPARK PLUG: Secure yet easy to change. ADJUSTABLE STRAPS: Dual adjustments for comfort. ADJUSTABLE TUBE: Lets the operator choose the length that is right for them. JOYSTICK-STYLE HANDLE: Throttle control and stop/run switch. PROTECTED CONTROL CABLES: Shield wires. LONG-LIFE CYLINDERS: Give maximum wear life, better cooling and lubrication, and more power output per cubic centimeter of engine displacement. SUPERIOR BALANCE AND DESIGN: Helps reduce fatigue and make handling easy. REPLACEABLE "IN-TANK" FUEL FILTERS: Lowerd cost and are easy to maintain. SMOOTH, CLEAN DESIGN: No rough edges to snag on clothing or brush. EASY-ACCESS CARBURETOR ADJUSTMENT SCREWS: Lets you adjust the carburetor for local cutting conditions and altitude. 2-RING PISTONS: Improve engine efficiency and hold compression longer than 1-ring pistons. They also transfer heat from the piston to cylinder better, helping engine stay cooler and last longer. ADJUSTABLE BLOWER TUBES: BR 500 has 2 positions, BR 550 and BR 600 have 3 positions. Heavy-Duty Pleated Air Filter: For durability. INTELLICARB" COMPENSATING CARBURETOR: Measures air on clean side of air filter and adjusts metering diaphragm in carburetor. Maintains RPM levels even when filter begins to clog.